The Canarian archipelago is home to a great diversity of species, many of which only exist on these islands and are in danger of extinction. More than half of the endemic flora and close to 40% of the invertebrate terrestrial fauna that exists in Spain can only be found in the Canaries. On the other hand this is the richest archipelago in endemic species of all Macaronesia, and one of the most important in the world in terms of botanic diversity. Thanks to the efforts of experts and scientists, in 2001 a catalogue with 450 species was published, many of them plants and animals as noteworthy as the blue chaffinch, the giant lizards of El Hierro, La Gomera and Tenerife, the dragon tree, the Egyptian vulture,the blue Mount Teide bugloss, the Barbary falcon, the loggerhead seaturtle, the lesser Neptune seagrass (which forms marine prairies in sandy areas), the purgeonfish and many others. The utility of this catalogue consists in the obligation to carry out specific actions for the conservation of all this biodiversity which is unique in the world. 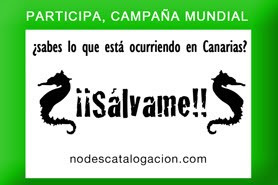 The parliamentary group of the Canarian Coalition (CC) has on 22 October 2009 put forward in the Canarian Parliament a bill of law aimed at creating a new Canarian Catalogue of Protected Species, based on the “excessive degree of protection” in the 2001 Catalogue. Several hundred plants or animals will only be protected as long as they stay within a natural protected area but if they tread, grow, swim or fly outside these sites they cease to be protected. They can also remain unprotected if these sites happen to be affected by a project or infrastructure considered of general interest to the public. The new catalogue will be much to the detriment of the endangered Canarian species. The new catalogue of CC is based on getting rid of the obstacles that may affect the construction of unnecessary great infrastructures: the harbour of Granadilla, the harbour of Guía de Isora, marinas, the insular ring of motorways, golf courses, etc., all this at the expense of the Canarian threatened species, which are for this reason left without protection. 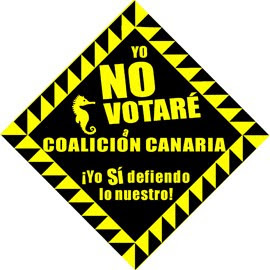 The Parliament of the Canary Islands is processing this nonsense as fast as possible with the support of the Canarian Coalition (CC) and the Popular Party (PP), and also thanks to the ineffective opposition of the Spanish Socialist and Labour Party (PSOE). It is intended to approve the Bill of Law without the participation of the citizenship, and what is even more appalling: without even considering the opinion of the scientific community, who is the one that really knows the actual status of the threatened species.